Feed your child’s creative side with individualized camps for ages 2-11. Construction Zone: Get ready as we bulldoze our way through construction camp! We will dig through dirt, knock down buildings, and build our very own special tower! Under the Sea: Just keep swimming…..! And dive deep into the great blue ocean to meet some of the most amazing creatures living there. Through recycled materials and our imagination, we will do arts and crafts that represent what we explore under the sea. Recycling will remind all of us to keep the ocean clean and trash free! Space is the Place: Let’s adventure to the moon and back exploring the different planets, stars, build a few rockets, and maybe get creative with the extraterrestrial. Let’s spark our imagination with art, math, and science that is out of this world! 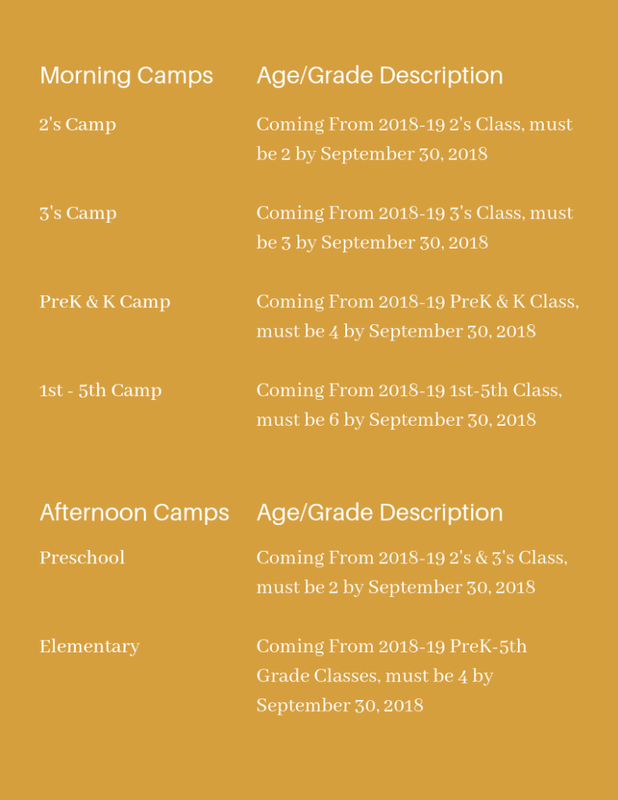 Gymnastics Camp: Come join us for a fliptastic week of Gymnastics and learn new skill on the mat and balance beam. Nature Adventure: What do plants need to live happily? Do flowers have a secret way of communicating with each other? Join us to find out! We will make nature wands and leaf prints with air dry clay, as we learn about the cycle of a plant and explore the land with our senses. At the Movies: Afternoons filled with games, challenges, and STEM activities inspired by blockbuster movies that all families love! Beach Fun: Students will create awesome crafts, play in sand, and learn some fun and exciting things about the beach! Dr. Seuss: This week is all about the incomparable Dr. Seuss! We will see who does or does not like green eggs and ham, we’ll play with Oobleck, and see if we can hear a Who like Horton can! Oh, the places we’ll go! This camp comes highly recommended by Thing One and Thing Two! Mad Science: Have you ever had the urge to mix a concoction or invent the next big thing? This is your chance to work with other campers and scientists and put your brain to the test. Join us in a journey into the realm of scientific discovery. With one part science and two parts imagination, Destiny School of the Arts will turn into a laboratory. White coats on- beakers in hand – HERE WE GO!! Taste of Nations: Adventure across the globe and let’s explore the art, culture, and cuisine of nations around the world! Come expand your taste buds as we learn what and how people commune across the globe. A Bugs Life: Dress up, dance, sing, and play as you explore the world of insects and beyond. What does a bug do all day? We are going to find out during this weeklong adventure into a bug’s life! Creepy crawly games, exploration, and more awaits you! Under the Stars: Join us around the fire as we explore the joys of sleeping under the starts! Activities include learning the art of storytelling, navigating constellations, exploring types of wildlife, and so much s’more! 4th of July: Red, white, and blue! Campers will have lots of fun doing activities with our 4th of July colors and playing indoor/outdoor games! Stars & Stripes Forever: From sea to shining sea join us as we explore the land of the free and home of the brave! We will explore iconic landmarks all across the United States that represent our country’s freedom. Join us as we learn, sing, and create celebrating our nations birthday! Party in the USA: Happy Birthday, America! Some of the best summertime memories come from celebrating the 4th of July! The children will have tons of fun making red, white, and blue projects (such as beautiful fireworks pictures and crazy 4th of July hats! ), playing outdoor games and having a super fun 4th of July picnic! Fun with Team Building: Kids are filled with curiosity and a desire to learn. So, let’s use it! This summer we will make friends using teamwork, creative thinking, and cooperation through activities and games that you can’t win alone! Your child will learn more about their capabilities and how they can use them when they team up with others to achieve goals they may not have achieved alone. Let’s work together and have some fun! Legos: Who doesn’t love Legos? Campers will have an opportunity to learn, build, and explore utilizing Lego bricks, as well as, play games, create art, and have a lot of fun! Little Green Thumbs: Let’s learn and grow as we explore the world of gardening, recycling, and more. We will play games, create fun arts and crafts, and learn about plant life cycles and so much more! Animal Planet: Lions, Tigers, and Bears! Oh my! Get ready as we learn about all of the different animals around the world! Under the Big Top: Come one, come all, it’s going to be the greatest week around! We’ll enjoy arts and crafts and carnival games. It’s going to be a circus! Full STEAM Ahead: Unleash your child’s imagination this summer! Welcome to the world of amazing experiments and cool activities that make you say WOW! STEAM (Science, Technology, Engineering, Art, and Math) is critical for the future. The world needs critical thinkers, doers, and problem solvers! Creative Painting Camp: Join us for a week of fun painting using a variety of materials such as shaving cream, rollers and marbles! Superheroes: During our Superhero Training week, students will be led through different missions and an exploration of what it means to be “Super.” We will start each day with team-building skills and then grow to include more individualized skills that mimic the powers of famous superheroes. Superheroes can inspire us to be greater and to be the do-gooders in the world! Dance Around the World: What better way to explore different cultures and their history than through dancing? Get ready to move, jump, and wiggle all around with folk dances from Peru, Bolivia, Austria, Colombia, and China. Holidays: Come along as we celebrate different holidays, such as Easter, Thanksgiving, and Christmas with fun activities, crafts, and games! Sports of All Sorts: How many sports can we fit into a week? Let’s find out as we wear ourselves silly with as many games, matches, and tournaments as we can fit into five days. We’ll include skills and drills and assorted activities to improve balance and focus while building strength and motor skills. Space is the Place: Calling all astronauts to come and take a spaceship to fun in outer space! This week we will explore and learn skills while pretending we are lost in outer space. Take a moon walk, learn monkey jumps on Mars, play disappearing planets, and have a picnic on Jupiter. Old Happy Games: Let the games begin! This week, we will host a tournament and play games like hopscotch, jacks, Jenga, chess, and other board games. Coordination and focus are key in these games, but so are joy and laughter! All About Painting: Discover painting with your fingers, marbles, balloons, and various rollers! Ready, Set, Launch: Mission control, NASA has given us a special mission this week. As astronauts, we will explore our Galaxy, the Milky Way, and learn about the planets in our systems. Get ready to reach for the stars! The Chopping Block: Watch out iron chefs, here we come! This week we will learn about food and how to make healthy choices. We’ll learn to measure and pour, as well as proper table manners! Mindfulness Through Knitting: Making mistakes are part of learning and through every knot, twist, and feeling of being stuck, we will practice mindful breathing while we have lots of fun finger knitting! We will make a mindful breathing wand and work as a team to create projects! Arts and Crafts: Join us for a week full of fun as we create little masterpieces on fabric, wood, ceramic time, and paper! around a “campfire” on the last day of camp. Community Helpers: Campers will learn about all of the great helpers we have all over the world! All About Art: Come discover art through paint, fabric, shaving cream, crayons, and much more! Legos: Who doesn’t LOVE Legos? We will spend the week building, creating, and playing games with Legos! Robotics: Machine learning is the way of 21st century life and the field of robotics is booming. Our Robotics Camp provides an interactive hands-on learning environment that equips students with key STEM skills. Students will learn about the elements of simple and complex machines while building, animating, and troubleshooting robotic creations. Whether you dream of becoming a Hardware Designer at Apple, an Aerospace Technician at NASA, or just love tinkering, your robotics path starts here! Summer Beach Fun: Come explore the beach here at Destiny School of the Arts. Your child will get to learn all about the beach and the ocean through exciting activities and crafts! Fizz, Boom, Pop: Students will learn about the Periodic Table and chemical reactions then create a few of their own! Four Seasons: Spring, Summer, Fall, and Winter! Students will have a blast creating crats and learning about all four seasons we experience throughout the year. A Pirate’s Life for Me: Join us as we decode pirate maps, scavenger hunt for buried treasures, make spyglasses, and so much more! Arrr Mateys!! Camp Creativity: This week will surely bring out the creativity in all campers! Campers will get to use different material and mediums to make crafts and do designs! They will do some guided crafts, as well as open ended crafts where the possibilities are endless! Legos: Who doesn’t love Legos? Campers will have an opportunity to learn, build and explore utilizing LEGO® bricks as well as play games, create art and have a lot of fun. Say Goodbye to Summer: This week we will revisit some of our favorite summer camp activities as we prepare for the end of summer camp and the start of a new school year! Movie Manie: What’s your favorite movie? Coco? Trolls? Cars? Moana? This week we will have art projects and activities based on your favorite movies! Camping: Let’s set out on an adventure! As we set off on our adventure we will play games, sing songs, share talks of fun around a campfire, set up a tent and stargaze! Of course, no camping adventure would be complete without roasting some s’mores! Imagination Station: Get your thinking caps on because curiosity, experimentation, and imagination run this week! With sparks of creativity, campers will be inventing new games and designing the unthinkable with the environment around them. No Bake Baking: Learn how to create some delicious snacks without even turning on the oven!